The IKEA catalog is a home decor catalog/furniture catalog where you'll find modern and contemporary furniture and accessories all at great prices. The IKEA catalog is certainly an inspiration with almost 400 glossy pages filled with beautifully styled rooms that will inspire you to transform your home, so it looks like it came straight from the pages of the IKEA catalog. The IKEA catalog is packed with just what you need for your living room, bedroom, kitchen, children's rooms, and other living spaces inside your home and out. Whether you're looking for a simple solution for a problem area, a seasonal refresh, or to completely makeover a room, the IKEA catalog is sure to give you some great ideas. Tip: Heading out to IKEA? Be sure to check out the free stuff you can get at IKEA including free food, childcare, giveaways through the year, and design services. Visit IKEA's catalog request page and click Sign Up Now! or scroll down to check whether you want to request either the printed catalog, digital catalog, or both. You'll also have the choice to sign up for email updates and/or text messages. Fill out your email address, phone number, name, and mailing address, and your choice whether you would like to join IKEA Family. Click Submit to put in your request for the IKEA catalog. There are also links at the bottom of the form to request an IKEA catalog without submitting your email or to opt out of IKEA catalogs you've already been receiving. You can now choose to answer some survey questions or opt-out by clicking Skip this step at the bottom of the next two pages. You'll receive your free IKEA catalog in approximately 2 weeks. 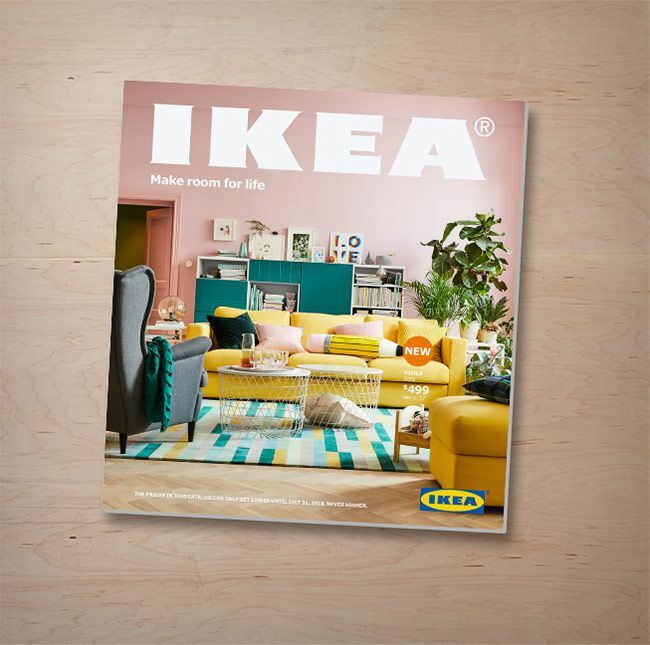 While you're waiting for your IKEA catalog to arrive, you can view the IKEA catalog online as well as any current flyers and specialty IKEA brochures. These include seasonal catalogs, sales flyers, sustainability guides, storage and organization guides, business brochures, and catalogs just on bathrooms, wardrobes, and kitchens. There are also online buying guides to help you plan your purchase of bathroom, bedroom, kitchen and dining, home organization, office furniture, children's spaces, living room seating and storage, lighting, textiles and rugs, and outdoor items. These include measurements, prices, and caring and storing of items. Even if you don't plan on purchasing any items from IKEA, it's a great catalog to have to give you inspiration for redecorating your home or simply refreshing it with some new ideas. There are ideas galore, especially in the first half of the catalog. It will give you ideas on everything from innovative ways to hang your kids' artwork, to ways to decorate your living room bookshelves so they look like they come straight from the pages of a magazine. Keep your eye out for the designer quotes within the catalog, they give some great decorating advice on how to spruce up your home. There are also some floor plans included to give you some new ideas on how to rearrange your existing furniture. The IKEA catalog will be mailed to those in the U.S., Canada, and many other countries. Visit the IKEA homepage and choose your country to see if the IKEA catalog is available where you live. If you like the IKEA catalog, you'll also like catalogs from Pottery Barn, Crate & Barrel, Restoration Hardware, West Elm, and Grandin Road.